Born in 1885, Kleist saw service in World War I with the hussars. A corps commander during the invasion of Poland in 1939, he led a panzer group during the fall of France in May-June 1940. 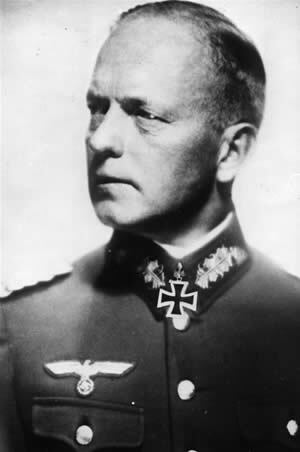 Although initially inexperienced in the proper use of armoured forces, he learnt quickly and had able subordinates such as Guderian and Zeitzler. Thus, by the spring of 1941 he was equipped to command mobile forces, and his First Panzer Group achieved rapid success in the Balkans campaign. During Barbarossa, his panzer group was attached to Army Group South, taking part in the great Uman and Kiev encirclements, before being ordered north to close the southern part of the Vyazma encirclement. On October 6, 1941, his panzer group became the First Panzer Army; it had taken Rostov by November, but was then forced to withdraw from the city and spend the winter of 1941-42 on the defensive. During Operation Blue, Kleist and his army advanced into the Caucasus, but long supply lines and Red Army counterattacks forced him to retire once more at the end of 1942. By this time he was commander of Army Group A and had been promoted to field marshal. His army group by this time consisted of the Seventeenth Army, which was ordered to hold the Crimea at all costs. As commander of Army Group A he could not halt the Red Army during the spring of 1944, and was relieved of his command. After the war he was first arrested by the Yugoslavs as a war criminal and sentenced to 15 years in prison in 1948, before being handed over to the Soviets in 1949. He died in a Russian prison in November 1954.